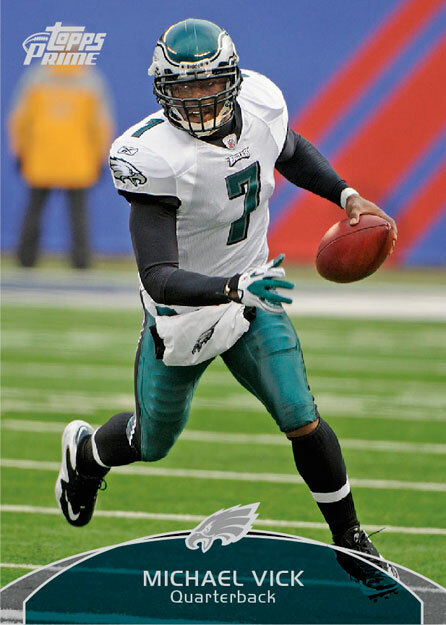 Although more expensive that a lot of products, 2011 Topps Prime Football offers some strong-looking value for those who are able to take the plunge. Priced a little higher than most mid-range products, Prime employs clean designs and strong content. Each box promises four autographs and relic cards, all of which will be numbered. Rookies get a lot of attention in the release, with 50 in the base set to go along with several levels of relic and autograph cards, not to mention rookie variations and variation parallels. One numbered autograph relic card. One numbered autograph rookie card. 150-card base set (100 veterans, 50 rookies). Autograph Rookie Card Variations (50 cards, 1:10) provide signed versions of the rookie base cards. All will have serial numbers. Parallels: Silver (/50), Gold (/25), Prime (/1). 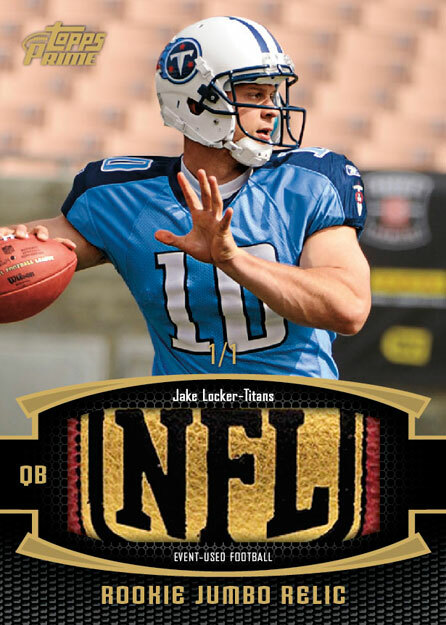 Prime I Rookie QBs (/10) highlight seven rookie quarterbacks in book cards featuring an autograph, wristband, football, patch, home jersey and away jersey. Prime I Rookies (/10) spotlight 29 autographed book cards each with six six relic pieces: glove, wristband, football, patch, home jersey, away jersey. Prime II Rookies (/15) has the same checklist as Prime I rookies but with five relic pieces on the book card: glove, wristband, football, home jersey, away jersey. Prime III Rookies (/25) put four rookie relic pieces on the card. Prime IV Rookies (/15) provide jumbo patch pieces from 36 rookies. Prime V Rookies (/1) offer three jumbo relics (football, glove, patch) on one book card. 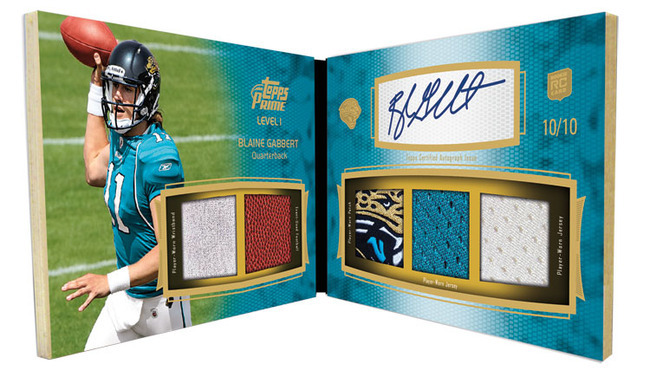 Prime VI include 36 rookies and 14 veterans on quad-relics (two swatches from both their home and away jerseys). Each card is numbered. 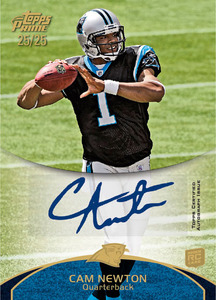 Hobby-exclusive parallels: Gold (/25), Prime (/1). Prime Rookie Jumbo Relics offer jumbo relic pieces for 36 different rookies. A Pigskins (/1) parallel are available only in hobby packs. Parallels: Gold (/50), Silver (/25), and hobby-exclusive Prime (/1, patch swatch). Prime Veteran Relics are numbered relic cards from 20 veterans. Parallels: Gold (/50), Silver (/25), and hobby-exclusive Prime (/1, patch swatch). 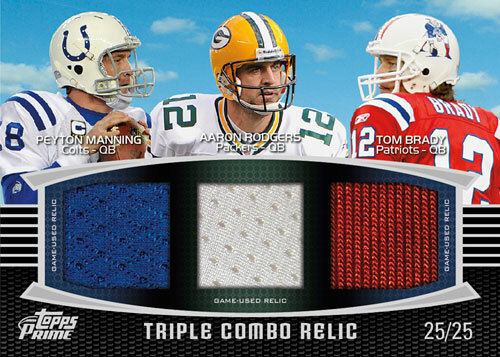 Dual, trio and quad Combo Relic Cards mix and match rookies and veterans on multi-player memorabilia cards. Each is numbered and has the following parallels: Gold (/50), Silver (/25), and hobby-exclusive Prime (/1, all-patch swatch). Prime Rookies, Prime Veterans and Combo Cards are memorabilia-free versions of the relic sets. One regular insert card will be inserted in each pack. Parallels: Gold (/50), Silver (/25), Prime (/1). Hobby only Base Set Parallels: Aqua (/199), Powder Blue (/75), Prime (/1). Rookie Base Variations have alternate, numbered versions of the set's 50 rookies. These variations are hobby exclusives and fall one per pack. Parallels: Gold (/799), Blue (/699), Red (/599), Purple (/499), Green (/99), Silver Rainbow (/25), Prime (/1). 2011 TOPPS PRIME FOOTBALL HOBBY EDITION SEALED BOX.